Please can we do something to remember Supersprout? Topic: Please can we do something to remember Supersprout? Re: Please can we do something to remember Supersprout? We're half way there Mum!!!!! I love the idea of a Supersprout seed swap each year.... a lovely idea! Or we could arrange for a nice fruit tree to be planted somewhere for her - maybe the hospice or on her allotment site if they have a garden area? I have just planted three apple trees and will remember her as they grow and fruit in years to come - and of course i'll mulch mulch and mulch some more! 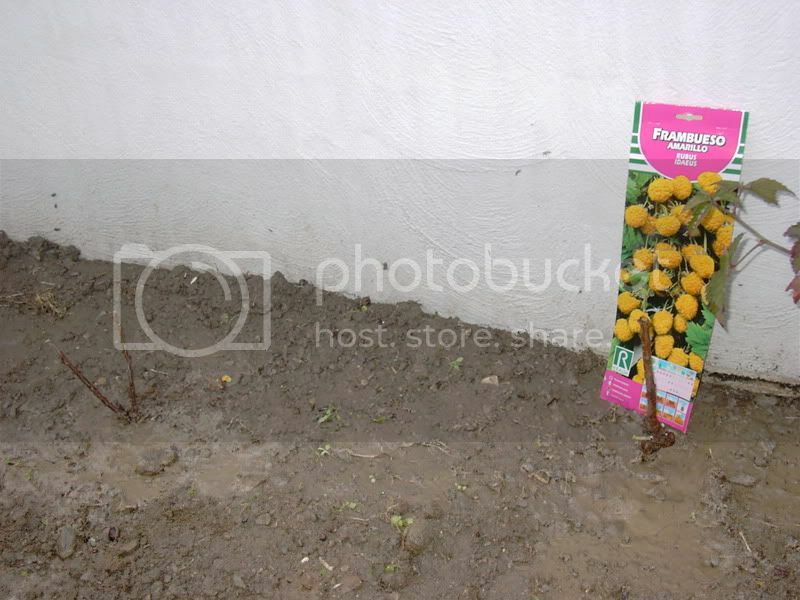 Planted a yellow raspberry for Supersprout along side it is a redcurrent in memory of my granddad who died on the 2nd Feb. DonÂ´t worry all of you! ItÂ´s getting mulched tomorrow, IÂ´ll make a pair of plaques too. Got loads done in the garden today IÂ´m sure SS was spurring me on! Could we maybe have a pumpkin/ squash competition this year, where entry is by donation? The money raised would go to the hospice, and it would give us all a great big harvest-time celebration in memory of Supersprout. My husband bought a plum/gage thing from Morrisons on Thursday. Perhaps I can dedicate the tree in memory of her. Perhaps we could have a seed swap at the wake, if that isn't too un-tactful? I am sure SS would not find that disrespectful! There are some lovely ideas on this thread. Remembering dear Supersprout is easy for me. Some time ago I promised to send her some red cyclamen seedlings. For a variety of reasons I didn't get round to doing it but every time I ambled past them in my garden, I thought of them as 'Supersprout's cyclamen'. They wont be going anywhere now but they will always be 'Supersprout's cyclamen'. Just like the old days! If I hear correctly, some 10 of our clan will be at the funeral. On another forum - someone said about a rose called Sarah. Well, I've tried to grow my mother - she isn't a very good Swede. Not tried growing my husband (a cabbage) yet. I am planning on coming to York. Will bring some seeds then. Run away! Run away ! I like the idea of the virtual cup. Really lovely idea that. When I was thinking about how we could remember Sarah I thought it would be nice if we all picked a post,a phrase,a tip or a picture that she posted and said why we liked it. No matter if the same thing gets picked time and time again. When I was thinking about how we could remember Sarah I thought it would be nice if we all picked a post,a phrase,a tip or a picture that she posted and said why we liked it. I recall her using the phrase 'strangers on a train' when referring to exchanges on the 'net'. For me, this encapsulates the warmth, however fleeting, that we get in dialogue with people that we may never actually get to know or meet. I only have to look at all the straw mulch on my plot to remember Sarah. Aw Derek that is really lovely. This reminds me of when she was telling me about meeting a supermarket buyer on a train and having in depth discussions with him about what supermarkets look for in their veg... far from being taste, they bought on evaporation and oxidisation rates... which goes to show what a friendly vivascious character she was - making friends with a stranger on a train. I was filling up my plug trainer, the type SS was so fond of, at the weekend and it made me think of Supersprout. I suggest that from now on plug trainers are known as "SuperSprouters"
this is what she very kindly sent me when I asked her if she thought the spiky lid might make it cat-proof. I've just looked to my right and my supersprouters have finally found the sweetspot! Never got the chance to tell her that this last sowing was perfect - thanks to all her help and advice! Been away from the forum for a few weeks and now discover this truly awful news about SS. Terrible shock to all, not least her family. Sincere condolences. It was because of SS that I am moving over to mulching and feel in greater control of the plot. The plot seems less full of weed-fighting prospects and with an increased level of plant/harvest instead! Like Emaggie - seeing all that straw will remind me of her.